STUNNING AVOCA DRESS WITH 2,000+ SWAROVSKI CRYSTALS!! This gorgeous dress catches every eye in the room and looks amazing on stage! Made for 2010 WRO and in PRISTINE condition–no odors, stains, or tears. 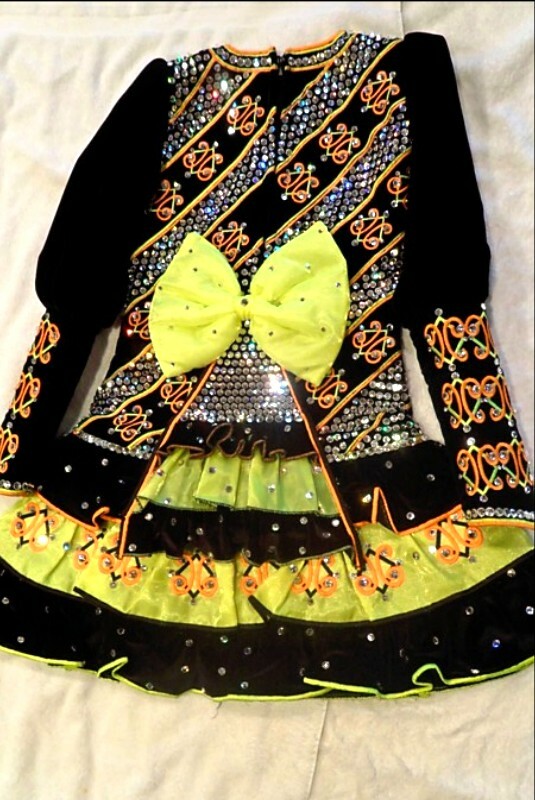 Black velvet dress with neon yellow and neon orange diagonal stitching (embellished with ss 34 and ss 40 Swarovski crystals) that alternates with diagonal rows of solid ss 34 Swarovski crystals. (Color appears a plain yellow in these pics, but it is a bright neon yellow with a tinge of green and bright neon orange–adorable!!! Headband pic has most accurate thread colors) Rah-rah skirt is current style–two layers of black velvet (with ss 34 Swarovski crystals) with a layer of embroidered neon yellow chiffon in between (again, more ss 34 Swarovski crystals). 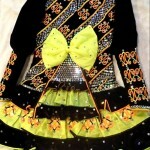 Back of dress has large neon yellow chiffon bow with attached capelet (both are attached on one side to dress). Black velvet headband has matching embroidery, ss 20 and ss 34 Swarovski crystals, and black velvet bow with neon yellow and orange ribbon accents. Two small matching ribbon bows and black spankies also included. Asking Price: $US1300. Free shipping to USA. Will split international shipping costs. Sale is final.